Charlie Gordon is an adult with a learning problem. He doesn't now how to read or write real well. On the first progress report he writes " progris riport 1". He worked at a bakery and was bullied by his co workers. The like to mess with him but he can't comprehend what is happening. Then all that changed. He went and got a surgery that made special needs people smart and able to learn easier. He still has to learn everything. 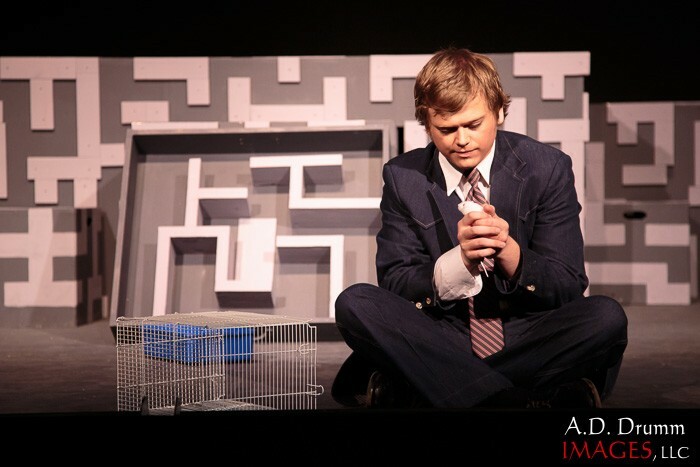 He is testing with Dr. Strauss, who is making him run through a maze to beat the mouse Algernon, The mouse how had the surgery before Charlie. He is learning about things he has never knew. He has learned to read and write. Not only that but has learned other languages and is smarter than most people. Then he is kicked out of his job because the co workers hate him because he is smarter than them. He moves away to another place to get away from his old life. He meets Fay his next door neighbor who he likes. She teaches him bad habits like becoming an alcoholic. He keeps seeing the old Charlie in places he isn't supposes to be. He goes to a meeting with the people who had studied the surgery that made him smart and he is not sober. 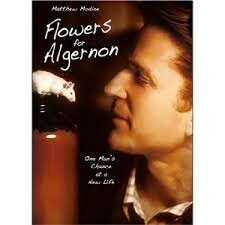 Then Algernon escapes and runs off through all the chaos Charlie finds him and takes him home. Charlie is having dreams about his past and how his mother abused him because he was different. He decides after a while he would go see her and his sister who was a jerk to him in his past. Charlie did not want to go see his mother or sister though because he was scared of them. He is seeing a change in Algernon he is becoming violent and is going crazy. After a while he dies. Charlie finally goes to see in family. His mother is terrified to see in and goes in shock but his sister comes home and is happy to see him. He finally goes when him mother threatens him with a kitchen knife. Charlie is slowly losing his intelligence and he is struggling to keep his new self from becoming his old self. In the end he is old Charlie telling you that he saw a person who looked like him but did not act like him and it was like looking through a window. Charlie is a man in his early 30s who has brown hair and eyes. 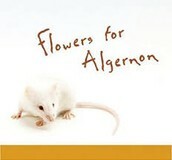 he is kind hearted person who cares for the people who he loves like Algernon. On pg. 168 July 5 " I dedicated my first piano concerto to Fay". The Conflict of the story is Character vs self. Charlie is having hallucinations about his old self and is struggling mentally. On pg. 193 charlie said " He looked down and I looked down at my hands to see what he was looking at. You want theses back , don't you? You want me out so you can come back and take over were you left off". The resolution is that Charlie losses his intelligence. The theme of this book is that you are perfect they way you are and you don't need to change yourself. My favorite quote is at the end when Charlie said " Ps. please if you get the chance put some flowers on Algernons grave in the back yard". There are lots of important parts of my book. The first one was when Charlie Gets the surgery that made his smart. 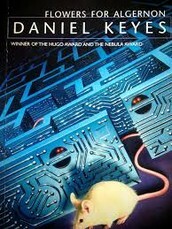 The surgery starts the whole book off. The other part is when Charlie losses his intelligence because the is the resolution. I give this book a 4 stars out of 5. I gave this rating because I liked the book but there are some chapters that were just filler and just annoying. I would recommend it to people who think they can handle a long story about a guy who is a little crazy. Cleveland Clinic Akron General. "​Brain and Skull Base Conditions And Treatment." Brain Treatments and Conditions. Cleveland Clinic Akron General, n.d. Web. 13 May 2016. Mumsnet. "Special Needs Conditions and Disorders." Mumsnet. Mumsnet, n.d. Web. 13 May 2016.